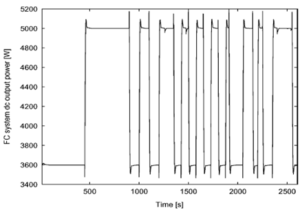 Dynamic Modeling, Design, and Simulation of a Combined PEM Fuel Cell. 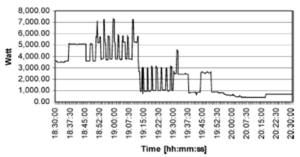 The available power generated from a fuel cell (F C) power plant may not be sufficient to meet sustained load demands, especially during peak demand or transient events encountered in stationary power plant applications. An ultracapacitor (U C) bank can supply a large burst of power, but it cannot store a significant amount of energy. The combined use of F C and U C has the potential for better energy efficiency, reducing the cost of F C technology, and improved fuel usage. In this paper, we present an F C that operates in parallel with a U C bank. A new dynamic model and design methodology for an F C- and U C based energy source for stand-alone residential applications has been developed. 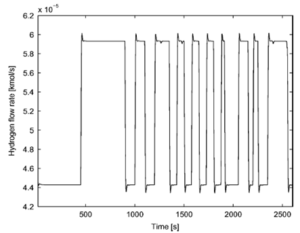 Simulation results are presented using MAT LAB, Simulation, and Sim Power Systems environments based on the mathematical and dynamic electrical models developed for the proposed system. Fig. 1. Combination of F C system and U C bank. Fig. 2. PCU and load connection diagram. Fig. 3. Real power of residential load. Fig. 4. Variation of FC system output voltage according to load demand. Fig. 5. 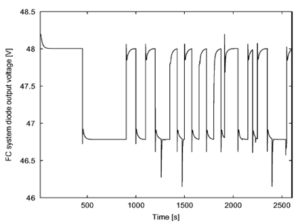 Variation of UC bank terminal voltage according to load demand. Fig. 6. Variation of UC bank charging and discharging current according to load switching. Fig. 7. Variation of ac output power. Fig. 8. Variation of ac load voltage. Fig. 9. 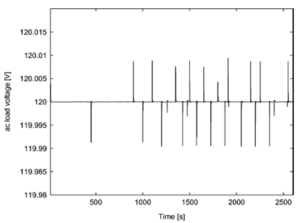 Variation of modulation index corresponding to load demand. Fig. 10. 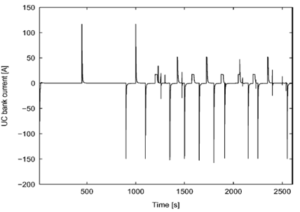 Variation of ac voltage phase angle. Fig. 11. 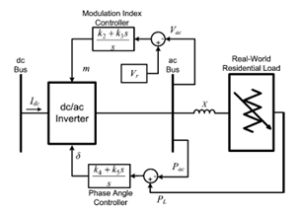 Variation of FC system dc output power. Fig. 12. 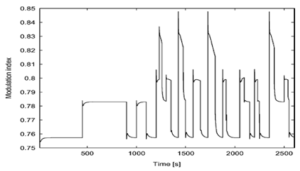 Variation of hydrogen flow rate. A UC-based storage system is designed for a PEMFC operated grid independent home to supply the extra power required during peak demand periods. The parallel combination of the FC system and UC bank exhibits good performance for the stand-alone residential applications during the steady-state, load-switching, and peak power demand. Without the UC bank, the FC system must supply this extra power, thereby increasing the size and cost of the FC system. The results corresponding to high peak load demand during short time periods are not shown in order to simulate more realistic load profile. 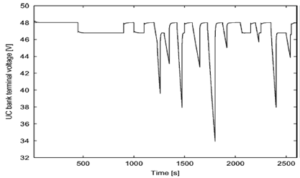 The load profile was created by measuring data at 15-s sampling interval. 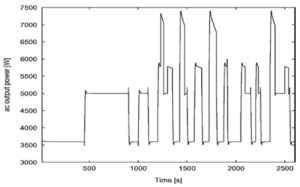 However, the proposed model can be used for different load profiles consisting of different transients and short-time interruption. Also, it can be extended for use in many areas such as portable devices, heavy vehicles, and aerospace applications. 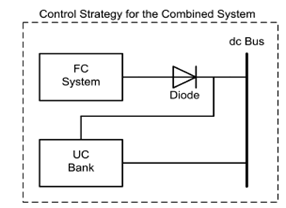 The lifetime of an FC system can be increased if combined FC system and UC bank is used instead of a stand-alone FC system or a hybrid FC and standby battery system. L. Gao, Z. Jiang, and R. A. Dougal, “An actively controlled fuel cell/battery hybrid to meet pulsed power demands,” J. Power Sources, vol. 130, no. 1–2, pp. 202–207, May 2004. T. S. Key, H. E. Sitzlar, and T. D. Geist, “Fast response, load-matching hybrid fuel cell,” Final Tech. Prog. Rep., EPRI PEAC Corp., Knoxville,TN NREL/SR-560-32743, Jun. 2003. 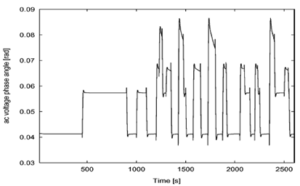 S. Buller, E. Karden, D. Kok, and R. W. De Doncker, “Modeling the dynamic behavior of supercapacitors using impedance spectroscopy,” IEEE Trans. Ind. Appl., vol. 38, no. 6, pp. 1622–1626, Nov. 2002. J. L. Duran-Gomez, P. N. Enjeti, and A. Von Jouanne, “An approach to achieve ride-through of an adjustable-speed drive with flyback converter modules powered by super capacitors,” IEEE Trans. Ind. Appl., vol. 38, no. 2, pp. 514–522, Mar.–Apr. 2002. A. Burke, “Ultracapacitors: Why, how, and where is the technology,” J. Power Sources, vol. 91, no. 1, pp. 37–50, Nov. 2000. This entry was posted in Blog, scribd, slideshare, website and tagged and Simulation of a Combined PEM Fuel Cell and Ultracapacitor System for Stand-Alone Residential Applications, Combined system, Design, Dynamic Modeling, Fuel cell (FC), Proton exchange membrane fuel cell (PEMFC), Ultracapacitor (UC). Bookmark the permalink.